These lightweight fr jackets from Bulwark, Carhartt and other trusted brands will keep you protected all year-round. Perfect for fall and spring months, our FR jackets keep you comfortably warm and compliant without adding bulk. 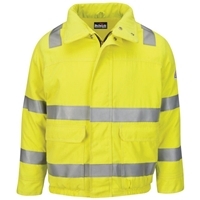 All of our fr clothing guarantee safety and long lasting durability. Shop below for the style and arc rating that best meets your needs.